Baking is one of my favorite forms of cooking and is one of the most rewarding, as everyone looks forward to dessert! Baking is also one of the more tedious forms of cooking as measurements are extremely important. Measuring is not my strong suit, as I am a southern woman who abides by measurements such as "a pinch of this and a dollop of that..." but I never guestimate when baking. Besides using exact measurements, another thing you can do to ensure your treats are tasty is use quality ingredients and avoid substituting. For example, I am a firm believer that baked goods are much tastier and have a more enjoyable texture when you use milk. In the past, I have experimented with dairy alternatives such as almond or coconut milk while baking and have been sorely disappointed. They just do not provide the richness and depth of flavor that milk does. The textures of my baked goods using dairy alternatives ranged from too dry and crumbly to overly wet and dense. Dairy alternatives just do not offer consistency in my baking outcomes. If I am going to spend time baking, I want it to be delicious and worth my time...and I rely on milk to help accomplish that. Milk and dairy are the stars of the show in my Pumpkin Tres Leches Bundt Cake. 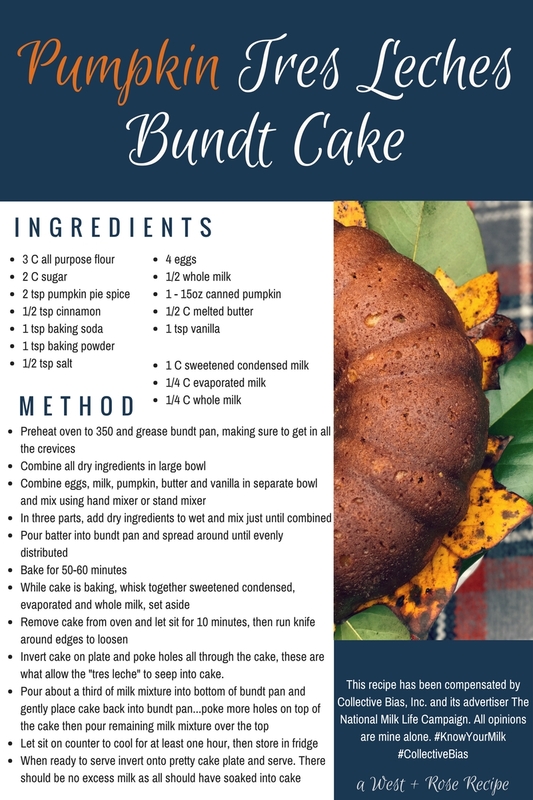 This creamy and luscious cake is filled to the brim with three kinds of milks, making this bundt extremely moist and sweet. For other great recipes, visit milklife.com! Aside from baking delicious treats, another reason I choose milk is to provide my family with essential nutrients like calcium, vitamin D and vitamin A. Milk is minimally processed, unlike dairy alternatives, such as almond milk which can contain added sugars, salt and thickeners like gums. Milk has no added sugar, just sugar that is naturally occurring in lactose. Milk also happens to be the most economical option in comparison to dairy alternatives and delivers more nutritional value per penny than just about any other beverage. I encourage all of my readers to visit milklife.com for more informational content regarding the benefits of consuming milk over dairy alternatives. Their website has a really great family zone area so your kids can learn more about why their parents are always telling them to "drink your milk!" I hope y'all enjoy this delicious recipe and keep drinking your milk!